Dav has consistently been attracted to interaction and storytelling. He began his career designing interactive experiences (improv theater projections, self-editing films, and CD/DVD design), moved on to linear storytelling (film), and has recently rounded it out with concepting future UX within feature films. He enjoys leading teams of artists in concepting out-of-the-box fantasy UX designs for feature films... and now designing functioning real products. The “normal” process for concept design is to first get a turnover from the client, then to produce sketches, then add color/detail, then animation. When we were asked to do a test for the Iron Man HUD design, we were given green screen plates of a dude looking around. When we asked for a turnover, they said, “make it look cool”. So I designed and animated a short test, and got awarded the work because it had a certain... “energy”. After months of experimentation and “wouldn't it be cool if...” conversations, we had something that Jon Favreau liked and was telling the story. The studio told us that since what they most wanted from us was design, could we assemble a small team to execute just a small number of shots but in doing so set the look, feel, and function for all devices. So we created a small company called one30 design (we needed a name for our group and it was 1:30am at the time). 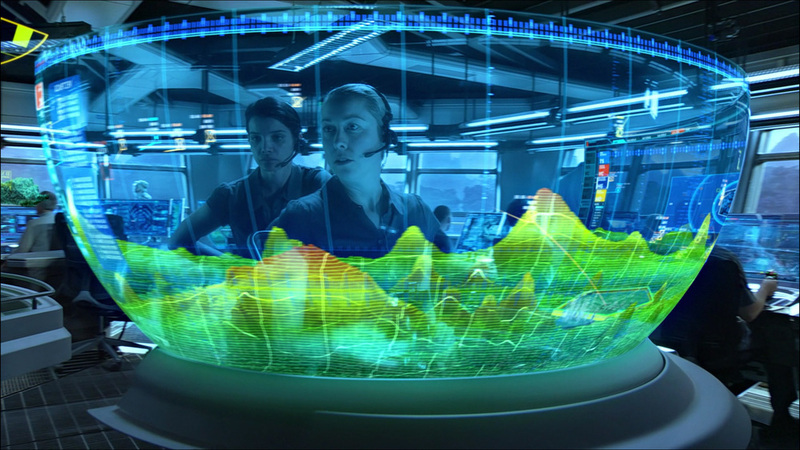 We worked with Steven Quale and James Cameron to design the screens, and most importantly, the interaction, for about two dozen shots. Then disseminated a design “bible” to the rest of the visual effects vendors to insure consistent design. When Doug Chiang asked me to join his Art Department, I was both honored and intimidated. When he explained that I would not have a team to lead, I rolled up my sleeves and prepared to get my hands dirty. By the time the film premiered, I had single-handedly concepted, designed and animated over 150 shots in 44 scenes for over 80 unique screens! I did all that and only logged about 12 hours of O.T. in over a year. Thank you Darnie for being the best producer evar! Legion was a joy to work on. It was always our goal at The Orphanage to make our own film. By the time The Orphanage closed it’s doors, Scott Stewart was knee-deep in his first feature film! I am so proud of Scott and all of the other Orphans for the work we did on this milestone film. Congrats Scott!